I really need to cook/eat more greens. I’m a little bit scared though. They look delicious. Mmmm, I love collards (although I typically can’t resist adding some bacon). These look amazing! Yum. I’m so happy you made this! My Lousiana hubby will be thrilled. Nothing makes him happier than collard greens, esp. HEALTHY collard greens! Frugal cooking is a great idea, especially nowadays. 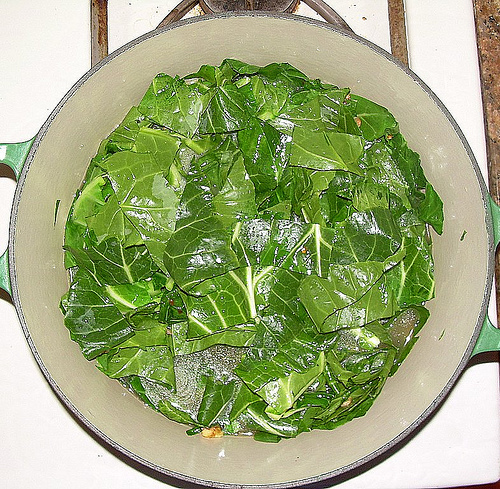 Braised collard greens sound excellent – I had them recently while dining out and now am looking forward to making them at home. I love this little event you started (and I love the look of your collards!) I’m going to keep it in mind and hope to join you some week. I assume as long as I submit it the week I post it (rather than the week I cook it) I’d be OK? There are a few other Friday events I juggle, but I’m going to keep you in mind. Yes, Nancy, the week you actually post it, not make it! Looking forward to linking to your posts!